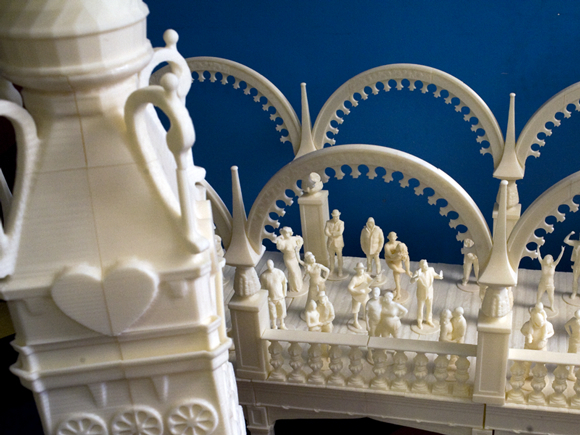 This weekend, the world’s largest 3D printed installation will be unveiled in the Coney Island Museum in Brooklyn, New York. A 1:13 scale model of Luna Park (the area’s famous theme park) as it was about a Century ago, with boardwalks inhabited by hundreds of models printed from scans of real life visitors to the artist’s studio, it’s an impressively ambitious and endearingly heartfelt print. It all began (doesn’t everything in this business) as a Kickstarter campaign about a year ago. Fred Kahl, also known as The Great Fredini, raised a cool $16,000 on the crowd-funding site to fund his Scan-A-Rama 3D portrait studio in Coney Island. 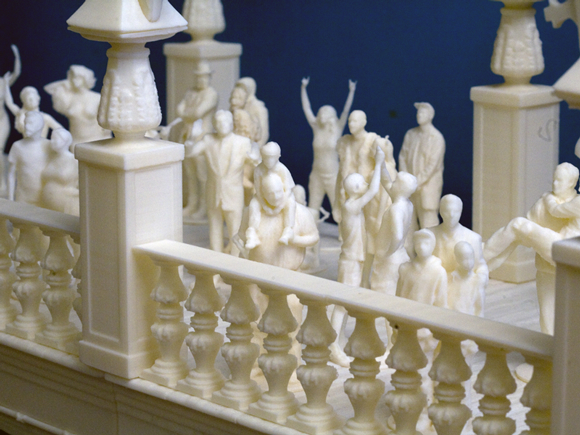 Customers at Fredini’s seaside attraction queue up to be 3D scanned before the artist prints them a full body figurine of themselves to take home. It is these figurines that populate the replica that The Great Fredini will reveal this week, its title Thompson and Dundy’s Luna Park: 3D Printed by the Great Fredini referencing both the attractions original creators and the artist himself. To commemorate the park as it was back in the good old days, Fredini used cutting-edge, custom hardware, including an Xbox Kinect controller that scans his subject’s bodies. Not only is the exhibit large it’s also living, with plans to continue its expansion across the next twelve months. Fredini will add more and more parts to his mini-park, further detailing the architecture of Coney Island as it was 100 years back. In those days, Coney Island was one of the country’s most popular destinations for holiday makers, earning it the nickname ‘America’s playground’. Though a fire in 1944 damaged the original Luna Park beyond repair, it was reopened in 2010 and has been central to the recent rebirth of the area. Luna Park has a special place in history, a witness to the society being transformed by technology. These are the themes that are relevant to us today as our world undergoes the third industrial revolution. This piece is also about a deep love of Coney Island as the cultural melting pot and showcase for presenting cutting-edge technology as entertainment.